NOTICE: Due to the weather, tonight’s Allentown City Council Meeting has been CANCELLED!! THIS MEETING HAS BEEN CANCELLED! HARRISBURG – Rep. Justin Simmons (R-Lehigh/Montgomery/Northampton) and Sen. Pat Browne (R-Lehigh) today announced the approval of Multimodal Transportation Fund grants to the borough of Coopersburg and Upper Saucon Township for safety improvements for motorists and pedestrians. LVC Editor’s Note: This event will be held at the Emmaus Fire Company #1, Sixth and Broad Streets, Emmaus, on May 3 2017, 6:00 to 8:00pm. We have attended one of their seminars and it is well worth attending. 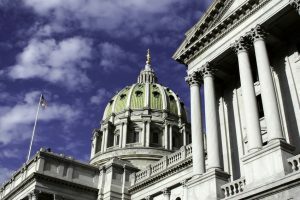 HARRISBURG – Rep. Justin Simmons (R-Lehigh/Montgomery/Northampton) today announced the awarding of a $260,000 state grant for a sewage system improvement project in Emmaus, Lehigh County. Simmons played a key role in securing the funding through the Department of Community and Economic Development’s small water and sewer grant program. Specifically, the grant will be used by Emmaus Borough to repair 100 severely damaged manholes and correct an inflow problem that was discovered through inspections. The borough is working to comply with an administrative order from the U.S. Environmental Protection Agency (EPA) to separate storm water from the sewage system, which flows to the Allentown Sewage Treatment Plant. REPUBLICAN PARTY: The Republican Party has internal rules that Party members (R-Committee) must support the Party’s nominees or else risk being thrown out of the Party. CONGRESSMAN CHARLIE DENT: Republican Congressman Dent went on national TV and announced that he will not support the Republican nominee for President, Donald Trump. Trump won anyway. HARRISBURG –The Emmaus Public Library has been awarded a $500,000 state grant through the Keystone Recreation, Park and Conservation Fund, Rep. Justin Simmons (R-Lehigh/Montgomery/Northampton) announced today. Simmons wrote a letter to Pennsylvania Secretary of Education Pedro Rivera in support of the library’s grant application. Please join us in Lebanon this Monday night, February 13, when we’ll be presenting the facts about the Property Tax Independence Act by people who really do understand the legislation. You know… people who’ve actually read it! During this presentation you will easily see that the information we’re getting from the education complex about this bill is totally inaccurate! We can say the following with all humility: We have yet to find a question that we couldn’t answer concerning this bill. Ron Boltz will make the presentation followed by a question and answer session with a panel that will include Jim Rodkey and David Baldinger.